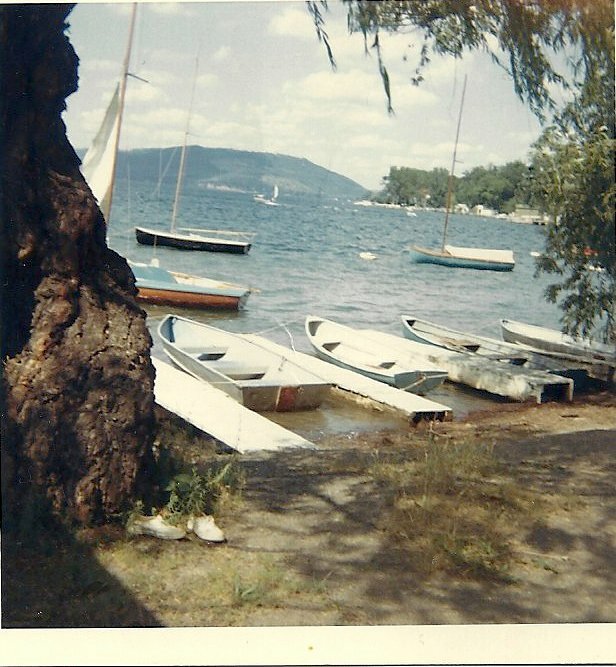 During this unbearably hot summer, I keep dreaming of my camp days, wonderful, exciting, and challenging days at a place called The Elms Camp for Girls on Keuka Lake. The camp no longer exists, I’m sad to say, but many of the buildings are still there, converted into summer homes that still whisper of songs sung after yummy meals capped with favorite desserts such as homemade puddings and pies. And of course there was the infamous “Bug Juice”: nothing quenched quite like this mysterious conglomeration of fruit-flavored liquids. Last summer many of us gathered for a reunion and tour of our beloved camp. Magically we stepped through the boundaries of space and time to find ourselves in a dimension where we were delightfully drowned in an onslaught of memories brought to us by ghosts of summers past. 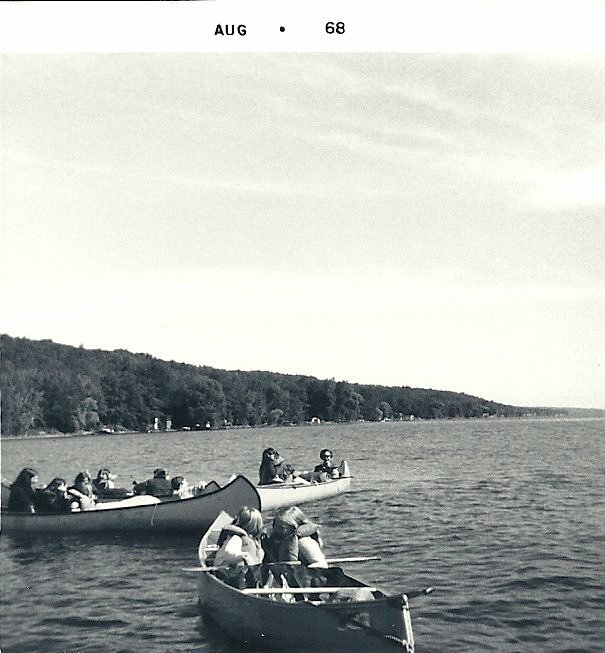 We yakked about the canoe trip down the length of the lake when we got caught in a vicious thunderstorm and had to be rescued by Mr. George, camp owner, in his classic wooden Cris-Craft. How embarrassed we were pulling into camp, all strung together in a long lineup of canoes, looking like human drips. We reminisced about the campfire circle led by Mr. Randall, our tough as nails swim team coach with a subtle gentleness that made us all feel loved. We sang, we played games, and we pondered the meaning of camp life. We laughed about our sailing exploits – coming towards the buoys with our beloved K-boats way too fast, unable to come about to tie up properly, and landing on shore to the chagrin of our counselors. We chatted about water skiing, being mortified as handsome Butch held us as we attempted to get on skis for the first time, or smashing into rough waves, having water shoot up various orifices in our bodies and needing to get to a bathroom — FAST! Finally — the pagoda! This was the enchanted place of the entire camp, the place where we went to watch sunsets and fireflies, the place we went to cry after an argument with a bunk-mate, or a reprimand from one of the counselors on whom we had a terrific crush. 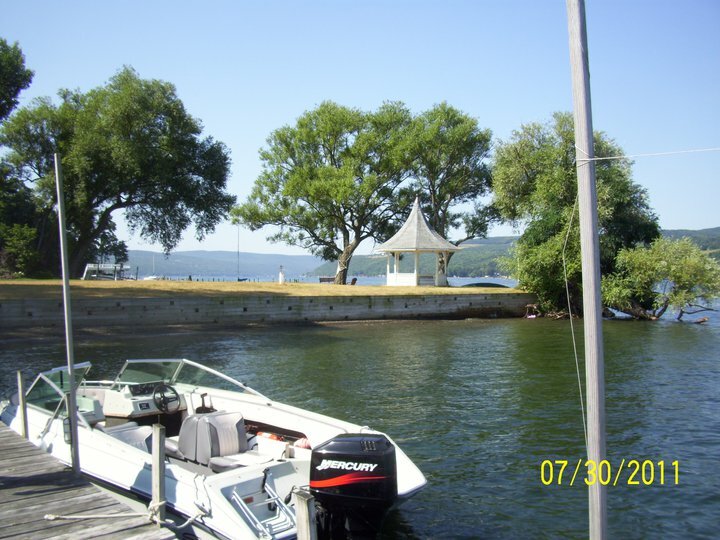 It sat stalwart on the very tip of the point that extended out into the lake, a landmark for sailors and boaters all along the lake shore. I was afraid it wouldn’t be there anymore. I was afraid it fell victim to storms, floods, or human hands of destruction. But it was there. I ran to it, alone, to ponder the past and celebrate the present. So many wonderful memories I could write a book. Perhaps I shall. In the meantime, please enjoy these photos of a day gone past but kept current and alive in the minds and hearts of over 100 former campers of The Elms Camp For Girls. Loved your blog! I too have been thinking about The Elms as my friends and colleagues drop off thier kids at camp or head out to Parents Weekend. My kids are long past that stage, but I remember fondly my 5 summers at The Elms. Thanks for your kind words, Natalie. Now we have to go for round two!! Hello! I am not sure how i came across your page but I’m glad I did. I never really thought about The Elms until recently. I had a few dreams lately which must have awakend my memories. My name is Shelley “Albee” VanAlstine. My earlies memories are when I was about 4 or 5 when I would spend the night with Peg getting up in the morning and having breakfast with lots of girls and making rounds with Peg or Margo. I haven’t seen Margo in many many years. I need to look her up… I need to reminisce!! Oh Shelley, I am so glad you did find this page! Do you know that we’ll be having another camp reunion next summer — July 19th, to be exact. Margo was at the one we had last summer, so she’ll probably be at this one, too. It was indeed a special place. Let me know if you’d like more info. I would love more info thank you! Butch is my uncle who I don’t see hardly ever and I havent seen Margo since I was in my early 20s. I found Margo on FB…I’m so excited!! Thank you so much for the FB page! I am no relation to Shelly. I spell my name slightly differently anyway. But I, too, remember staying at The Elms not long after ceased being a girls camp. We stayed in the log cabin a couple of years, and then in the “bunkhouse”. Obviously nicknamed for the days when it was a girls camp. When we stayed there, there was still writing on the ceiling dating back to around 1969 when it was a girls camp. We used to sit there at night and read everything that was written. It was a lot of fun. This had to be between 1973 and 1976. It is a thrill to get your post! It’s funny, I don’t really think about what happened right after the camp closed. Did you rent the buildings for summer vacation? I would love to hear more about your experiences on our beloved campgrounds. Thanks so much for writing, Jo. 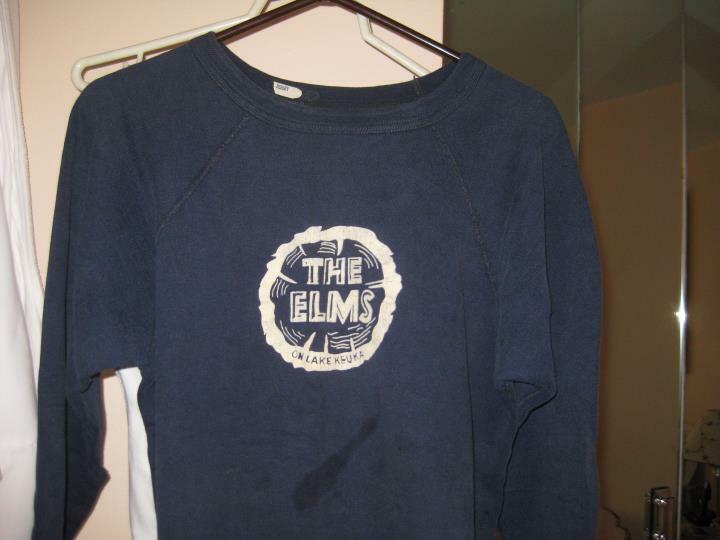 The Elms carries many of the fondest memories or my childhood. When you were there, what were some of the projects you led us in? Jo, You were my counselor! I was reminiscing with my daughter today about The Elms and then happened upon this page. My last name then was McManus and I am Mark and Ethel Randall”s niece. Although my one summer at camp was memorable and the people all wonderful, I was terribly homesick and did not return for another summer.